1. Josh McDaniels, offensive coordinator, New England Patriots (age 41): New England’s offensive coordinator since 2012, McDaniels could have had just about any job in the NFL he wanted for the past three offseasons, but hasn’t found the right fit. He’s technically a re-tread after a humbling two-year stint in Denver, but at 41 with a PhD in Belichick-Brady football, he’s far and away the No. 1 coaching free agent. 3. Teryl Austin, defensive coordinator, Detroit Lions (age 52): Austin’s cut-and-dry, zone-based defense has oscillated from a Top 3 performer to a middling unit that collapsed against the run in last year’s playoff loss at Seattle. The former secondary coach is partly responsible for the development of shutdown corner Darius Slay, and is said to have impressed in his various interview opportunities. 4. Jim Schwartz, defensive coordinator, Philadelphia Eagles (age 51): The former Lions head coach has led the transformation of a defensive unit that ranked near the bottom of the NFL in points and yards allowed in 2015. Schwartz coaches in profanities and has an abrasive reputation with some around the league. 5. Steve Spagnuolo, defensive coordinator, New York Giants (age 57): He runs a complicated, heavy-blitzing defense that has begun to put all the pieces together. The former Rams head coach is one of the most unpredictable defensive play-callers in football, with a knack for putting one-dimensional players in a position to thrive. 6. Jim Bob Cooter, offensive coordinator, Detroit Lions (age 33): Detroit’s offensive coordinator since 2015, Cooter distilled the offense for Matthew Stafford, utilizing a slower pace and a diversity of formations to take advantage of Stafford’s ability to judge defenses in pre-snap. For Cooter, much will hinge on an offensive boon in Year 3. 7. Kris Richard, defensive coordinator, Seattle Seahawks (age 37): The former NFL defensive back has quietly diversified and expanded Seattle’s base Cover 3 defense and added more blitzing and man coverage than predecessors Gus Bradley and Dan Quinn, both of whom got head-coaching opportunities after stints in Seattle. Richard, like many Carroll protégés, will interview very well and will benefit from a Quinn endorsement. 8. 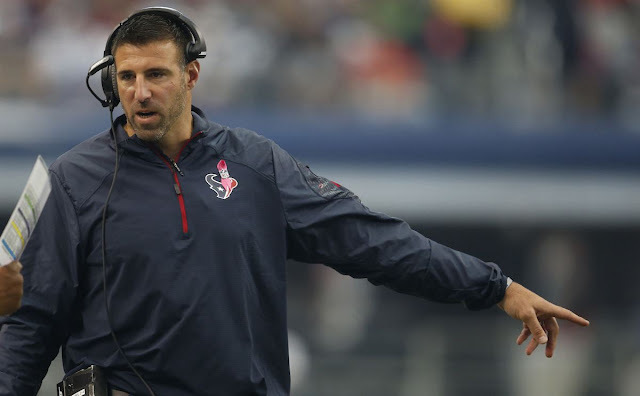 Mike Vrabel, defensive coordinator, Houston Texans (age 42): Another Belichick disciple, Vrabel had a leadership role in arguably football’s best defense in 2016, and now takes over as defensive coordinator with Romeo Crennel moving to assistant head coach. Considered a tremendous motivator, Vrabel would be one of the most successful former players to ever become a head coach. 9. Dave Toub, special teams coordinator, Kansas City Chiefs (age 55): Considered one of the great special teams coaches of all time, Toub, 55, helped develop Devin Hester into arguably the greatest return man in NFL history during his decade in Chicago. If a special teams coach is going to get the nod to lead an NFL team in the near future, it will be Toub. 10. Marquand Manuel, defensive coordinator, Atlanta Falcons (age 38): Dan Quinn handed over the reins of Atlanta’s defense, including playcalling, to this former defensive back from Miami. That’s a big deal for Quinn, who opted for Steve Sarkisian to replace Kyle Shanahan on the offensive side, in part, because he preferred an experienced playcaller.